ABC Family already has a pretty hip and devoted audience tuning in for Pretty Little Liars each week, and the network is hoping just as many—if not more—individuals will invest in Ravenswood, the brand new spinoff drama set to premiere this October. We’ve finally gotten a look at what Ravenswood’s setting and cast will look like, and the drama looks particularly eerie. I guess it is about a curse. 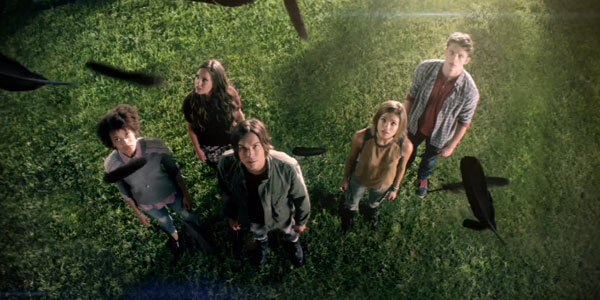 We don’t get a ton of footage from the upcoming program, just lead Caleb Rivers (Tyler Blackburn) finding a mysterious black feather on the ground and running straight for a creepy old cemetery, with some of the other cast members, played by Merritt Patterson, Britne Oldford, Brett Dier, and Nicole Gale Anderson, following in pursuit. They all end up at an old statue in the middle of the cemetery, standing before an angel holding roses as feathers rain down from the sky. The teaser is short, but it makes sense that we wouldn’t be getting any footage from actual episodes yet, as TV.com is reporting that filming only began on the series last week. I’m sure the drama could have shown us a more information-filled teaser, but why would they when they can set a short scene to the popular the Civil Wars song, “The One That Got Away,” and call it a day? You clicked, didn't you? Ravenswood will follow a town located near the Pretty Little Liars setting of Rosewood, Pennsylvania. The setting might be picturesque, but the town is suffering from a curse that has threatened those who live there for generations. During the series, five strangers lives will be woven together because of the curse, and they will stop at nothing to end the generations-old punishment. Now, we’ve gotten a glimpse at the five characters the series will revolve around, as well as a look at a few old photographs in the teaser that will likely tie into the series somewhat. ABC Family has decided the time around Halloween will be the perfect occasion to begin airing Ravenswood. The network has a Halloween special planned for Pretty Little Liars that is set to air on Tuesday, October 22 at 8 p.m. ET. The word premiere of Ravenswood will follow at 9 p.m. ET that evening, on ABC Family. For PLL fans, it should be a pretty good night of TV. Additionally, teasers often lead into full trailers for programs, so if you've been waiting to learn more about Ravenswood, now is the time to keep your eyes peeled.